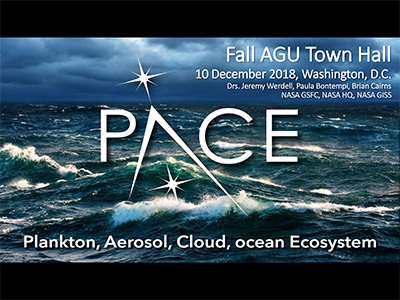 What is PACE going to measure? 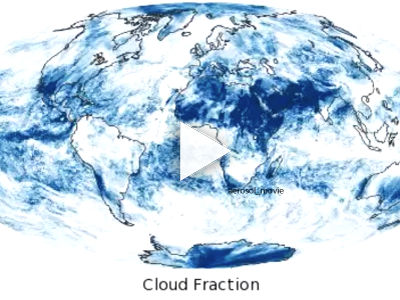 Photos of Earth taken from space show vast blue seas and stretches of white clouds. Looking more closely  and beyond what we can see by eye  reveals important details about our living ocean and climate. In orbit, PACE will measure light emitted by Earth, or its "radiance," at the top of the atmosphere. This signal will include everything below it; thus, scientists will need to separate contributions from the atmosphere and ocean. Being located farther from the satellite, only a small fraction of light will come from the ocean. 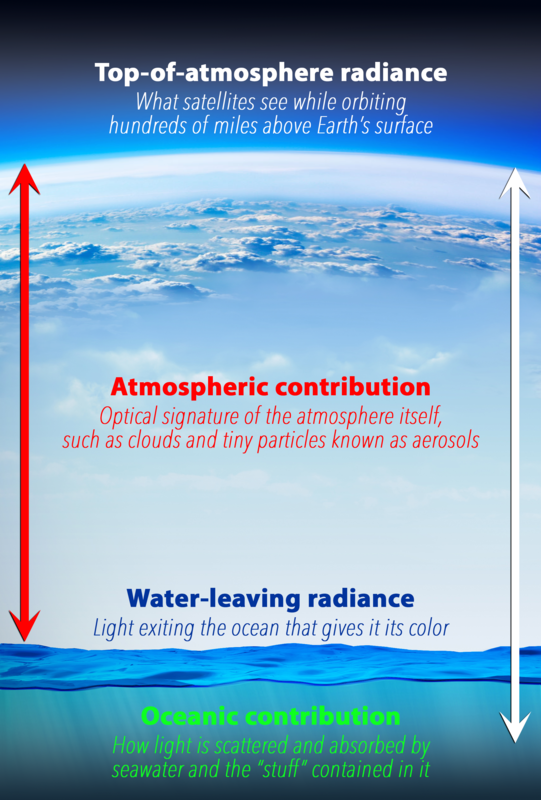 Subtracting the signal of the atmosphere helps to determine a key value, "water-leaving radiance." 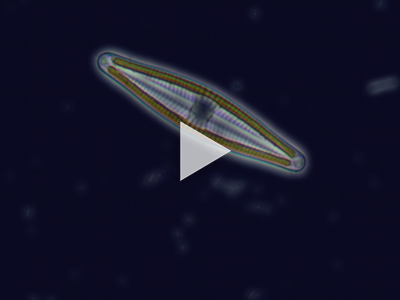 This can be used to learn more about microscopic algae (phytoplankton) at the ocean surface. How? 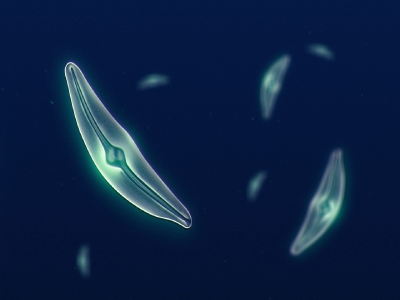 Phytoplankton have various shapes, sizes, and pigments; all of which affect ocean color. 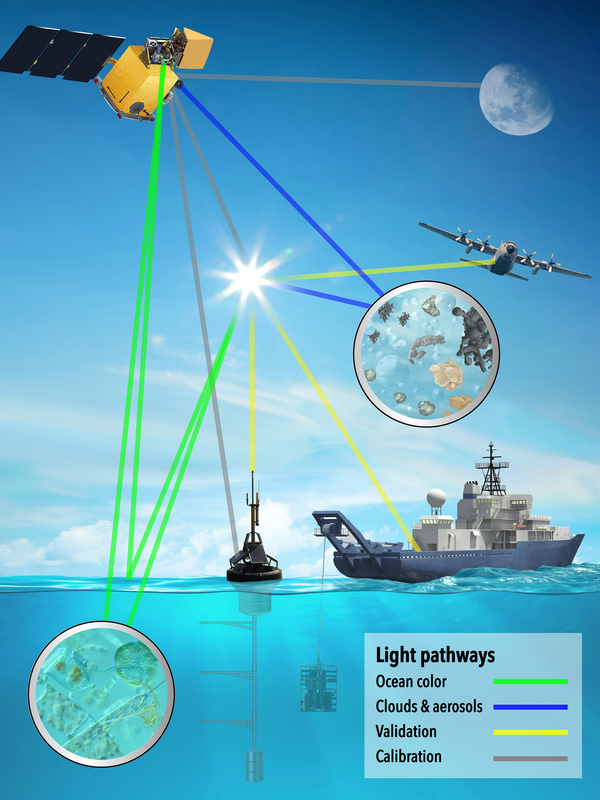 To help decipher phytoplankton types, PACE will sense color at very high resolution and over a broad spectrum: from ultraviolet to infrared wavelengths. Color is not the only property of light that tells us about our planet. Light's polarization  how it oscillates within a geometric plane  is another important dimension of information. 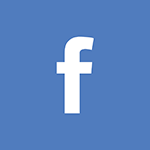 For example, when sunlight interacts with clouds or aerosols, its polarization can change. 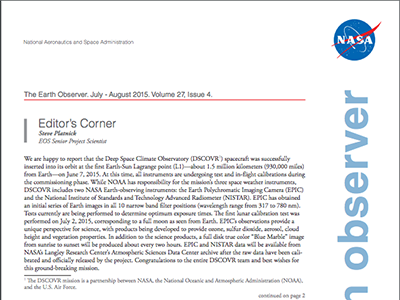 Measuring these types of changes will help us better understand our atmosphere and climate. 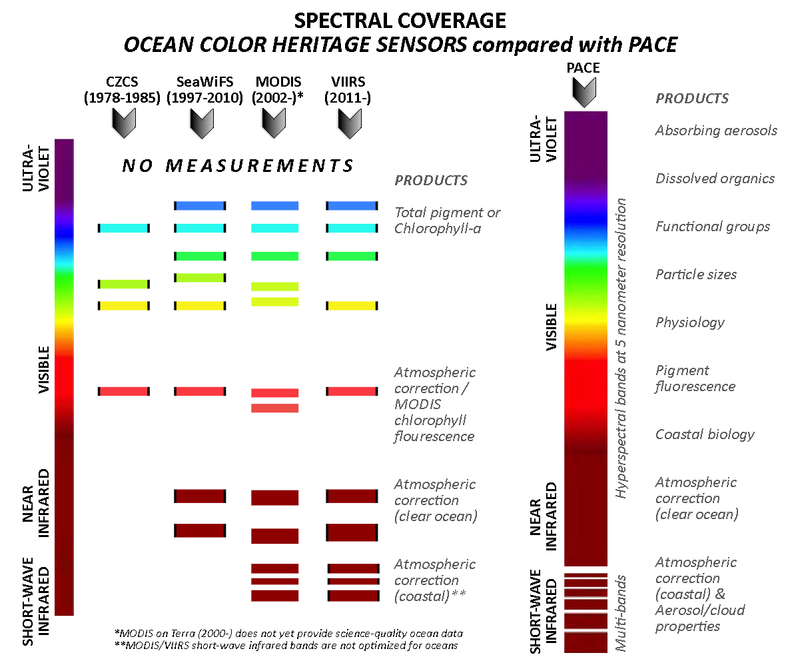 PACE's primary sensor is the Ocean Color Instrument (OCI). 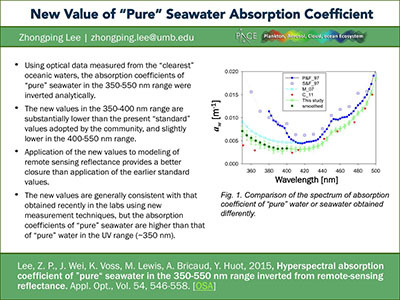 Its unprecedented coverage of broad wavelengths at high resolution will not only benefit ocean science but atmospheric science, as well. 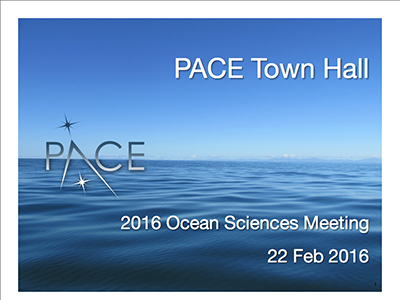 OCI data will be complemented by measurements from two polarimeters being planned for PACE. 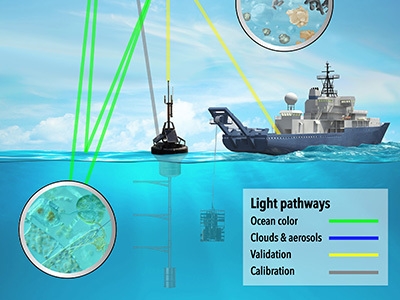 These instruments will focus on the study of clouds and aerosols. 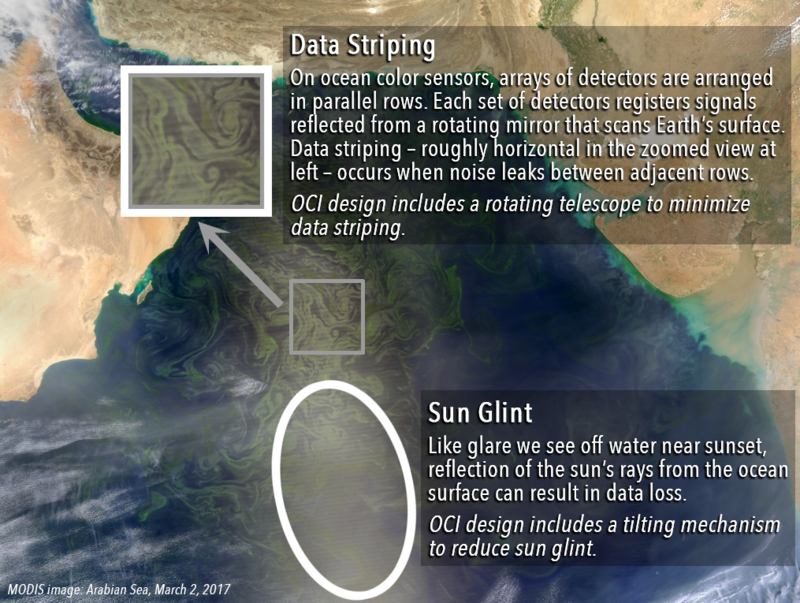 Minimize artifacts such as sun glint and data striping. 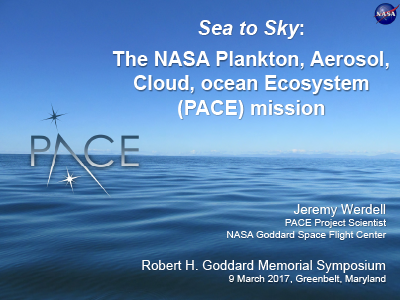 How is Earth changing and what are the consequences for our living resources and food webs, such as phytoplankton and plankton? 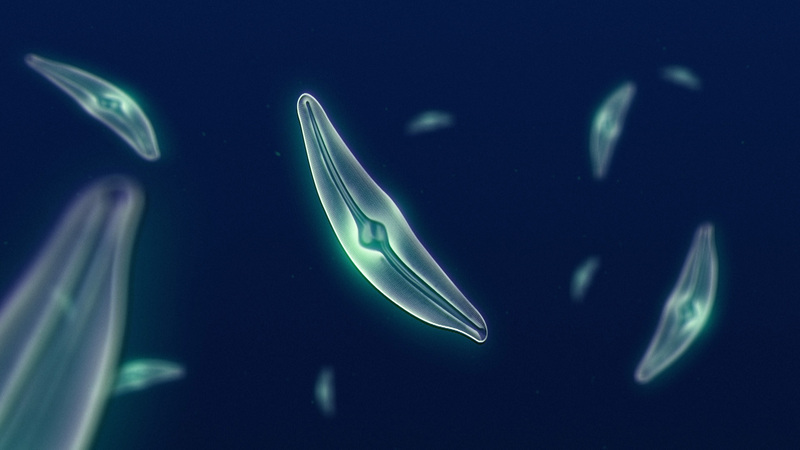 What is the concentration and composition of organisms in our ocean ecosystems? 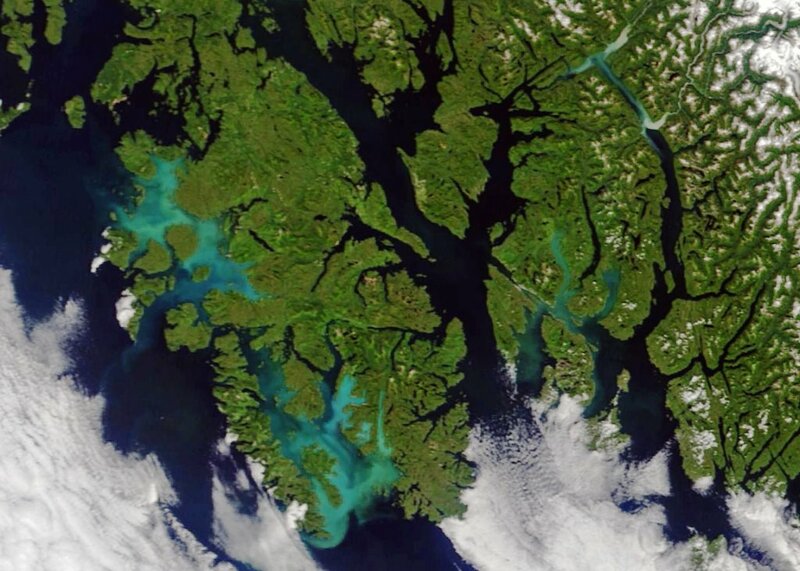 How productive are our ocean ecosystems? 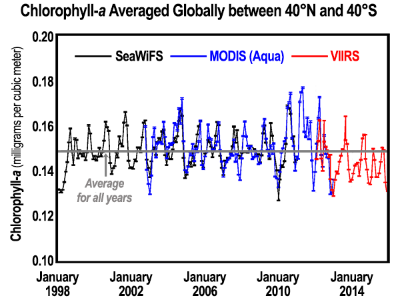 What are the long-term changes in aerosol and cloud properties that PACE can continue to reveal? How are these properties correlated with variations in climate? 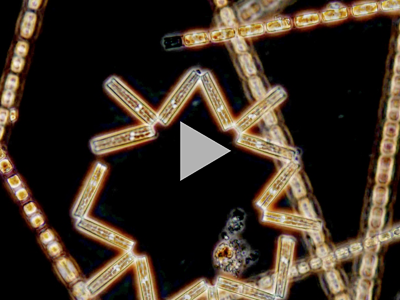 How are biological, geological, and chemical components of our ocean changing and why? 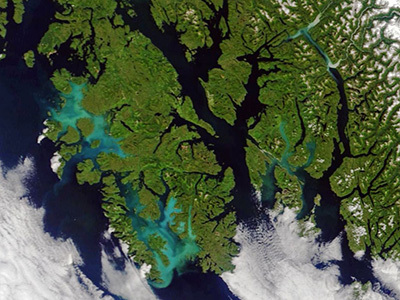 How might such changes influence the Earth system? 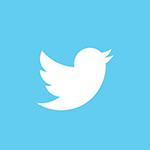 What materials are exchanged between the land and ocean? How do these exchanges affect life on our coasts? 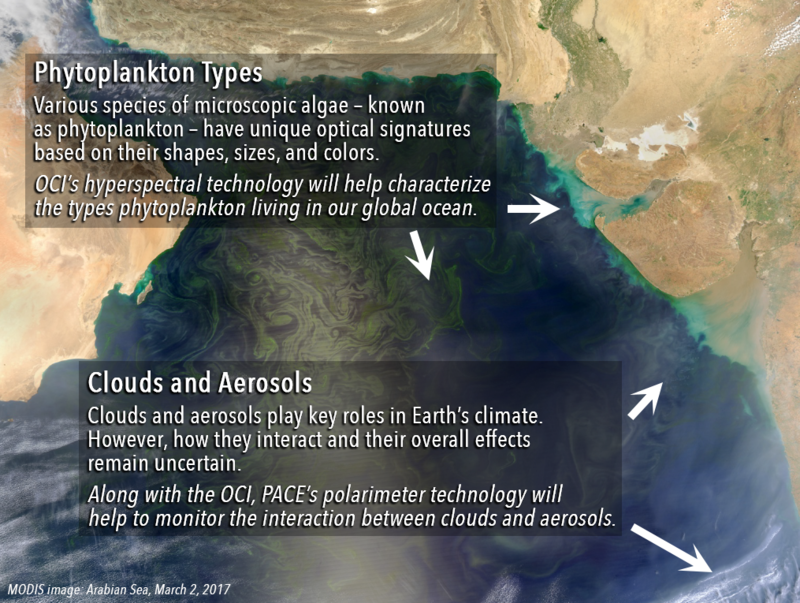 How do tiny airborne particles and liquids  known as "aerosols"  influence ocean ecosystems and cycling of matter in our ocean? 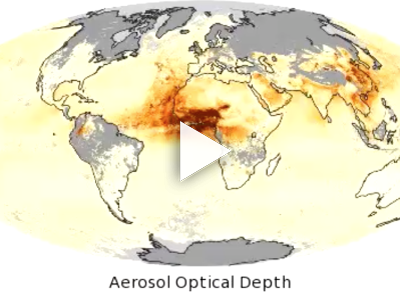 Conversely, how do ocean processes affect our atmosphere? 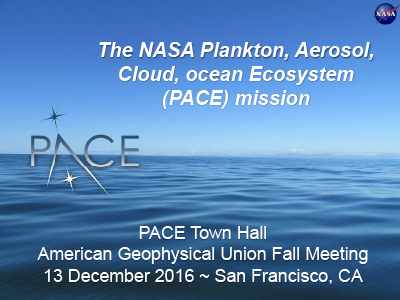 How does our ocean's environment  and motion  affect its ecosystems and vice versa? What is the distribution of both harmful and beneficial algal blooms? How are these blooms related to environmental forces? 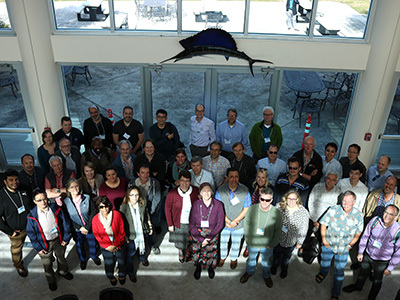 How do changes in critical ocean ecosystem services affect people's health and welfare? 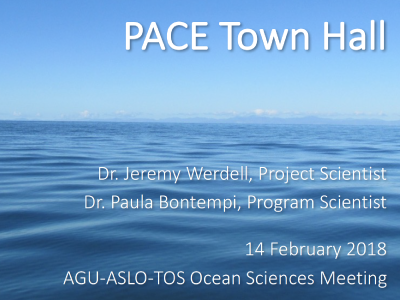 How do human activities affect ocean ecosystems and services? 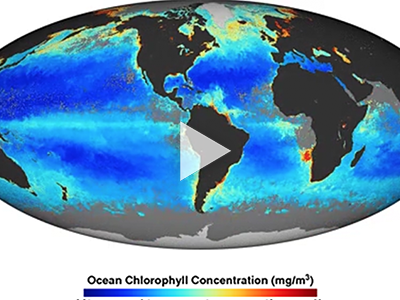 An 18-year continuous record shows variation in average chlorophyll-a concentrations (about 0.15 milligrams per cubic meter) between 40°N and 40°S latitude. 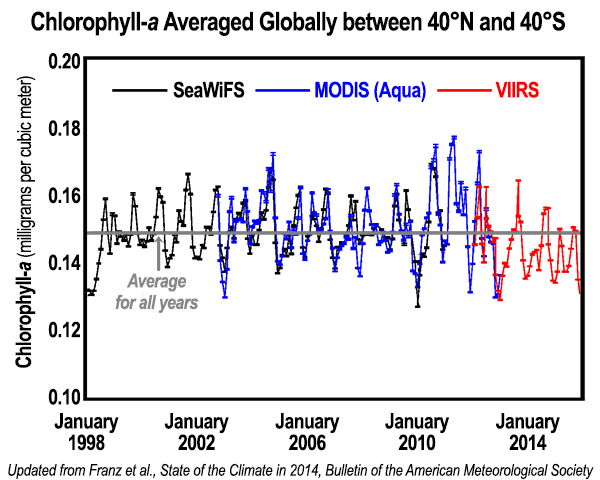 Credit: Figure updated from Franz et al., State of the Climate in 2014, Bulletin of the American Meteorological Society. 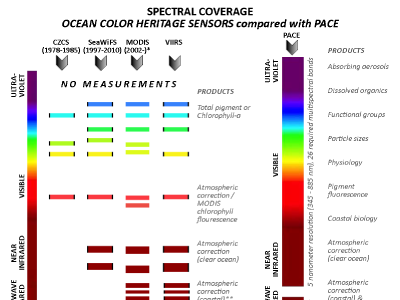 Comparison of PACE spectral coverage with heritage U.S. ocean color sensors.